Hi Everyone!!! 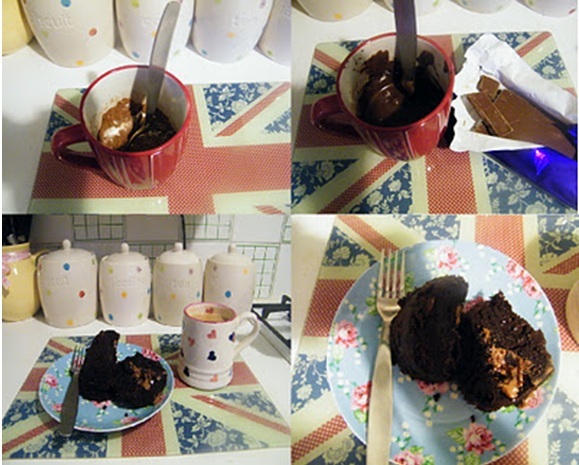 I’m Katrina from Muffin Top Vintage, Maria asked for guest posts and I thought I would volunteer :) Now I am a huge chocolate cake fan so when I stumbled across this recipe that meant you could make a chocolate cake in 5 minutes using a microwave, a few years back I have made it my mission to share it with many people as possible. Let's be honest, sharing is caring right?! Add 4 squares of chocolate to the middle, make sure it sinks & is covered by the mixture. Using a flat knife make sure the middle is cooked, if not put back into the microwave for another 30 seconds. Repeat if necessary. That looks so yummy! I might have to give that a go!! This is definitely intriguing! I'll have to give it a go one of these days!